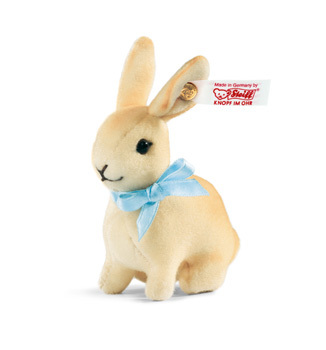 Steiff Bunny Rabbit Discounts Apply ! Made from The Finest Light Brown Quality Trevira Velvet. Look what the magicians at Steiff have pulled out of their hats - one of the tiniest rabbits we've ever made! At a mere 7 cm in size, this little bunny will make a big impression throughout the season. Sewn from soft trevira velvet a classic modern Steiff material our rabbit is meticulously airbrushed by hand. Of course, her mouth and nose are hand-stitched, too. A pale blue bow has been delicately tied around her neck. Whether for yourself or as a gift, our Bunny will add something special to every Easter celebration. with Safety Eyes and stuffed with Safety Filling, and with gold plated "Button in Ear" with elephant motif and Surface Washable. This Rabbit is part of Steiff's 2014 Exclusive range.